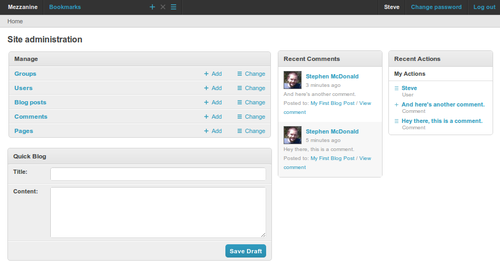 Its goal is to resemble something like Wordpress, with an intuitive interface for managing pages and blog posts. Mezzanine takes a different approach from other Django applications in this space like Pinax or Mingus that glue together a lot of reusable apps, instead opting to provide most of its functionality included with the project by default. On top of all the usual features provided by Django such as MVC architecture, ORM, templating, caching and the automatic admin interface, Mezzanine provides the following features. Apart from Django itself, Mezzanine has no explicit dependencies but is designed to be used most effectively in conjunction with the following libraries.